Warning the following contains spoilers from the second episode. This episode had a lot of developments. The next 8 entered the house. The demise of the Crazy 8's? The 2nd Head of Household is crowned! The rise of the "metro-sexual cowboy"? And the fist member of Team America is announced! Lets take a look at what happened. 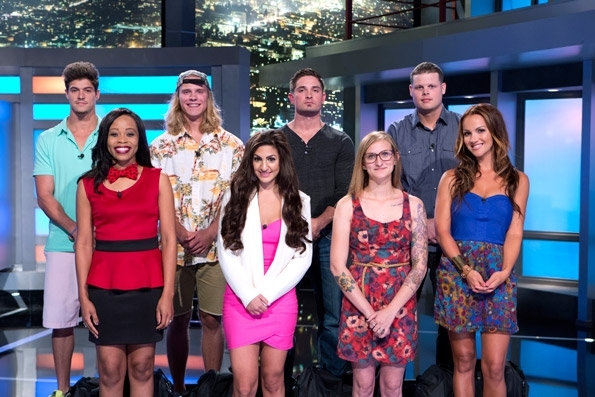 Well the final 8 have just moved in Brittney, Caleb, Christine, Derrick, Hayden, Jocasta, Victoria, and Zack. In the first episode we saw almost a natural division of the house with the group who entered the house 1st teaming up. But almost immediately several members of the Crazy 8s were looking to align with the new House Guests. While others saw threats to their game. Devin who started the Double Ds with Donny seemed to want to find someone to work with from the new group. HOH #1 Frankie connected with Victoria future BFF's? Meanwhile Derrick felt uneasy with the 1st 8 as did Caleb who felt like he was on a different team. Paola aka "Pow Pow" was not feeling the vibes of Caleb. A rotating barbecue smoke pit was waiting for the house guests to hold on to in the backyard. Going in Frankie was pulling for Victoria so they could work together as HOHs but she ends up dropping first so that plan went up in smoke. (terrible just a terrible joke) Caleb and Hayden end up as the final two competitors but this was Caleb's comp to lose. At one point the self described "metro-sexual cowboy" was holding on with just one arm and leg impressing many with his win. This lead to Devin and Frankie both expressing interest in working with Caleb. JOEY!!! The blue haired liberal! This was a shock as many assumed Frankie with his following to be the 1st member. We learned they will be getting tasks to earn $5000. Joey seems like she could do really well with this. Depending who her partners end up being this could be a force to be reckoned with. What did you think of the episode? Will Joey make a good member of Team America? Who do you want to be the last 2 members? Tell me your thoughts in the comments below. You can also reach me on twitter @CoryCShow Where I will be live tweeting the feeds. Make sure you check back for all the Big Brother content you desire. And download the Big Brother Buddy App and follow us on twitter @BigBrotherBuddy for instant updates from the house.